Poured from a bomber into a snifter. A: Opaque, dark brown color with no foam head. Scant lacing remains on the glass. S: Roasted malt is dark and smoky. Umami outdistances cocoa amongst the identifiable qualities. Yeast contributes fairly clean breadiness, but only slight fruit. No alcohol is detected. T: Begins very off-dry, with flavors of roasted grain, umami, chocolate and mild wood smoke. Acidity is muted into the middle where bitterness develops and accentuates the chocolate and coffee flavor qualities. The finish sees an early departure of the precocious bitterness that makes way for soft and comforting vanilla. No alcohol is detected. M: Medium to thick viscosity, dense but slightly acidic on the palate, with moderate carbonation. D/O: This beer has aged to its undeniable benefit over the course of three years. While not as intense as fresh Sea Monster, it bears no sharp edges. The prominent (and out-of-place) acidity has been dulled considerably with time, while a previously undiscovered thread of vanilla is shown the light of day. What little oxidation this beer suffered has apparently contributed more than it detracted. A meat-and-potatoes American imperial stout has become something sublime. This was poured into a tulip. The appearance was a nice looking black color with a slim finger’s worth of white to off white foamy head that quickly dissipated leaving some light clingy lacing. The smell had a sweet cocoa to sticky licorice, light roast of coffee and an ample amount of anise settling nicely underneath my nose. The taste was mainly sweet and roasty. A light vanilla did help to balance out. An even-ed out delicate delivery of balanced vanilla licorice boozy aftertaste lead to a semi - sweet and wet finish. On the palate, this one sat about a medium on the body with a fairly decent sipping quality about it. Carbonation, what carbonation, is it there? Not really, but for the style and age, I’m not worried. It’s good stuff. Overall, I say this was a pretty good D/IS that I would have again. Very good (and quite hoppy) when fresh, but absolutely divine when aged for a year or two (or three). Smooth, but intense dark chocolate and coffee notes for a stout without additives. Exceptional mouthfeel. Criminally underrated. I don't understand the modest ratings for this at all. I think it's much better (and less boozy) than Rasputin and on par with Yeti and Expedition. Appearance: pours a black color with a 2" creamy dark tan colored head. Thick lace is left on the inside of the glass as it goes down. Smell: chocolate, coffee, and roasted malt tones are up front, with a hint of bitterness in the background. Taste: big roasted malt flavor with bitter dark chocolate, some coffee tones, and a hint of grapefruit or similiar tart citrus arriving late. Alcohol is mildly noticeable, and there is a hearty bitterness balancing this one out. Mouthfeel: heavy in body. Lightly crisp to start, smooth and creamy at the finish. A bit of drying arrives late too. Aftertaste is long as the flavors linger in the mouth. Drinkability: despite the high alcohol level, this beer goes down smoothly. A definite slow sipper, one bomber should be enough in a session, but I could see having one more glass. Great flavor. 22 ozer pours straight black with a surprisingly large, fuzzy tan lid that lasts. The nose is not overly powerfull, but comes in mildly with roasted grains and bittersweet dark chocolate. Some sweet caramel and dark currant smells eminate as well, with light, piney, hops. Flavor comes in with the pretty much the same ammo minus currants. Mouthfeel has a ton of carbonation. Body is about a medium, but the carbonation comes in too strong for a stout. Especially one that should be, according to the bottle, an oatmeal stout. Sea Monster Stout has a nice scent/flavor, but lacks in my expected smooth, creamy, oatmeal stout mouthfeel. Good balance though. 22oz undated bottle at 50 degrees, courtesy of SouthBay Drugs. Pours opaque black with a one inch head of brown, somewhat porous foam. Retention is short-lived, and the head quickly drops to a placid surface with zero lacework. Dark chocolate, charred malts, and coffee grounds lead off the nose. A hint of flaked oats and dusty straw is way underneath. A hint of grapefruit seems misplaced. Full bodied with a chewy, oily mouthfeel. A bit thinner than I like. Rich chocolate, roasted barley, burnt malt, and espresso start the palate. Hints of fresh, oily, chewy oats, and Kahlau follow through. Finishes with charred bakers chocolate, coffee syrup, and some fading cereal undertones. Alcohol is barely warming and hardly noticable. Certainly tasty, oily, and chewy, but the cereal-like oat flavor is a bit much. Kind of an odd taste in the very end. Otherwise, the beer is somewhat unmemorable albeit quaffable. On Tap at Uno's Chicago Grill during a Bella Vista Event. 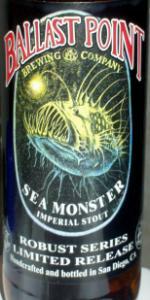 Sea Monster pours out your average stout black with a deep black space look with a creamy mocha shaded cap that left some sticks here and there. Upon smelling this I am reminded of Dragon Stout from Jamacia, that is rotted fruit, although this is less offensive. Extreme warmingh brang out light chocolate, earthy hops, licorice and rotting fruit. a whiff of alcohol, not a great smeller. The taste is not to far off from that. That rotting smell seeps into taste, old dark fruit. Dragon stout light with some chocolate with warming. Vanilla bean, light hops, alcohol, this is a bit disjointed. Feel is there, a bit chewy, approaching full bodied, I just cant get past that rot gut. Carbed up but smooth with a nasty aftertaste. Im glad I did not buy a bottle of this, I'll stick with the Ballast Point IPA's, they know how to do them. I had the barrel aged version of this on tap two years ago and that was significantly better. A monster indeed. On tap at Obriens Looks like a guiness. It smells very clean, withsome malt hitting you as well. First sip hits you with the choclate then some bready malt and nice west coast hop for a decent aftertaste. Creamy mouthfeel. This is an above average stout. The alcohol is hidden well enough that you can knock back more than a few. 22oz bomber: This one pours an inky, very dark brown color. There was just a touch of a brown head that didn’t linger long. Getting lots of aromas in there. Chocolate, some coffee, a bit of vanilla, maybe some dark fruits too. The taste is very good. Chocolate, some roastiness, vanilla, maybe some raisin as well as other fruits. It has a very silky mouth-feel to it. Very Nice! Sampled from a 22oz bottle in a DFH snifter. Temp was 50 degrees at the start. There's no date on the bottle but I think it's fairly young. Thanks to LarryG. A - A deep black with no light coming through. A small, beige head that dissipates quickly. S - Dark chocolate, brown sugar, marshmallows, oatmeal cookie and licorice. What's not to like? T - Sweet but not too sweet with elements of molasses, brown sugar, licorice and a touch of vanilla. Initially I didn't get much from the hops except for a lingering bitterness long after it's left the tongue. But toward the end, I got more hop bitterness. The alcohol is there but well balanced. Even though I started fairly warm at 50 degrees, it gets better as it warms. M - Thick and chewy with a smooth, silky finish and a very low carbonation. D - Rich and complex flavors that keep you guessing and coming back for more. This sea monster was hunted down and given to me by Rolie Polie OlieIPA. Swell fella. Appears to be a really deep dark shade of brown. Near black. Frothy light beige head. Slowly settles to a thin film. Lacing is negligible. Bitter chocolate hits first. Followed by dry coffee grounds. Big robust flavor. Thank you. Ends with a little sting. I'm starting to get something of a vinegar hint. Not really happy about that. Full bodied, but very dry. Not as smooth as I would like. Had high hopes for this brew but I think I am a little underwhelmed.